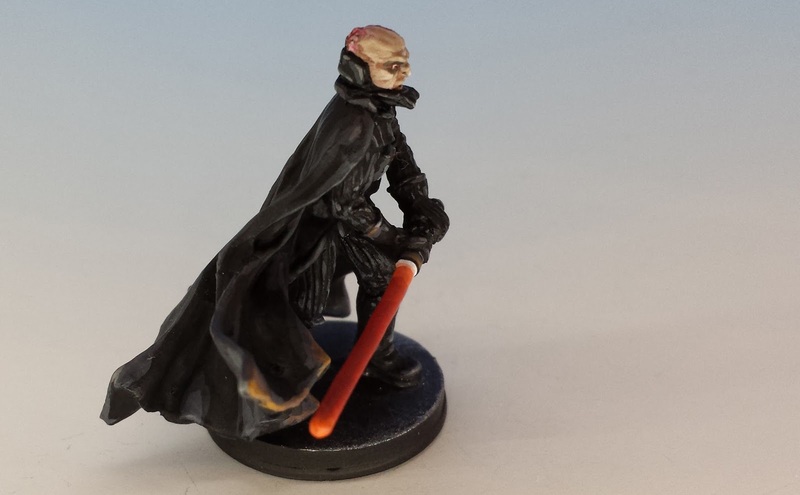 It's amazing what you can do with an X-Acto Knife and an unshakable faith in the Dark Side of the Force. 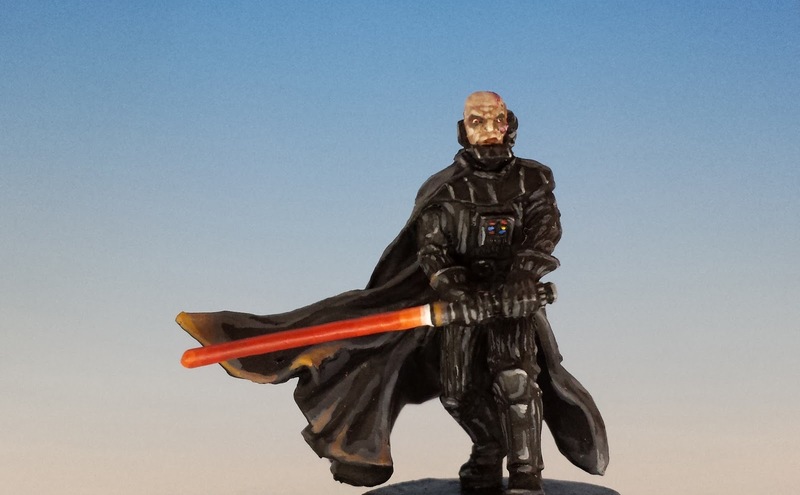 Here's my most recent miniature conversion for Imperial Assault, the Star Wars skirmish game from Fantasy Flight: Darth Vader without his helmet. 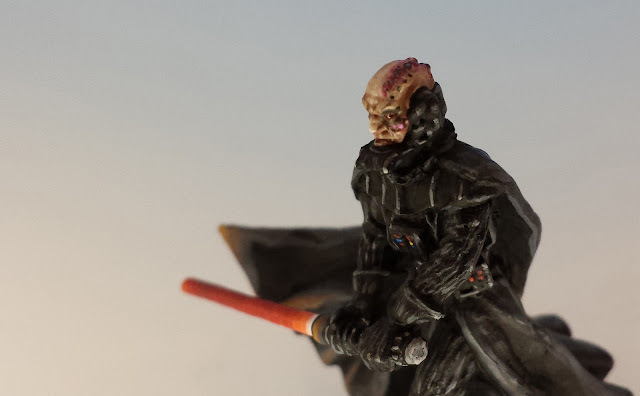 If there's anything scarier than Darth Vader in his mask, it's Darth Vader with the top down: the bruised eyes, the long unhealed wounds, and the skin pale as a moonscape. There is no better subject if you want a miniature as a portrait of a person in pain. 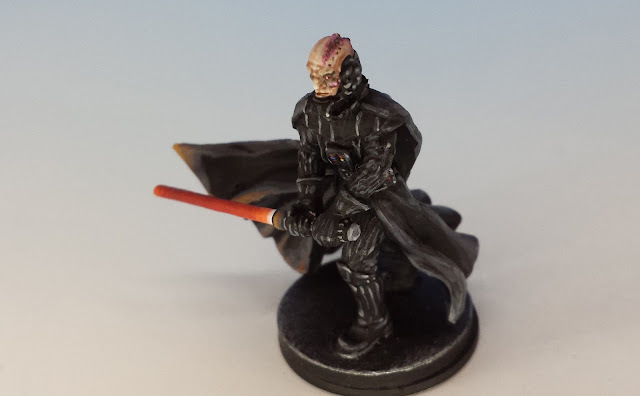 The conversion was dead simple: I sliced off Darth's helmet just above the base of his triangular mouthpiece, and then lightly sanded the surface until it was even. Then I hunted around for a replacement head, eventually settling on a Warhammer 40K Space Marine Terminator Lord. This Terminator was appropriately bald and scowley. 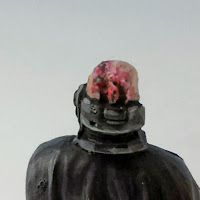 I cut off the bottom of the head so that when it was in place, it would give the impression of Vader's head sunk into the high collar of his suit. The fun part was the painting. Vader's ruined face gave me a lot of room to mess around, especially all his vivid scars. I'm pleased with the way it turned out, insofar that his expression seems to change depending on his facing. Sometimes he looks evil and sullen, sometimes he looks evil and crafty, and sometimes he just looks plain evil. I hope you join the Dark Side soon. Your dedication to the dark side is disturbing...who am I kidding, I always cheer for the empire. Your conversion looks as though it isn't a conversion at all, which is what all good conversions should look like. All you need now is a true path dark Luke! Wooo, absolutely amazing! I hadn't thought of that, really nice idea and work! Thanks guys for the feedback! I'm really glad you liked Darth. Hey, I hope you don't mind, I posted about this on my own painting blog... I only have a few readers but I thought more people should see it :). It's really amazing conversion work with a lot of character. I believe the name speaks for itself). Lolololol. Thanks for noticing that ;DD I only wish I had more material to post on that one. This article highlights aggressive behavior from puppy stages through to mature dogs. Reasons for aggressive behavior and finally some fixes for the most common aggressive behavior. Some good common sense CBD oil for dogs which needs to be read to turn the light ON! Many States in America and Australia have taken the path to legalize cannabis. Other countries are either following suit or considering options. So what is the position now? Is it good or not? The National kratom for sale of Sciences published a 487 page report this year on the current state of evidence for the subject matter. On my last visit to Sydney Australia I looked for an authentic Traditional Thai Massage, and I found it! I tell the story of my experience and a little about the history of Thai Massage. If you've ever been to Thailand and had the real thing, you may be cbd concentrate to find out where you can get same kind of experience right in Sydney.